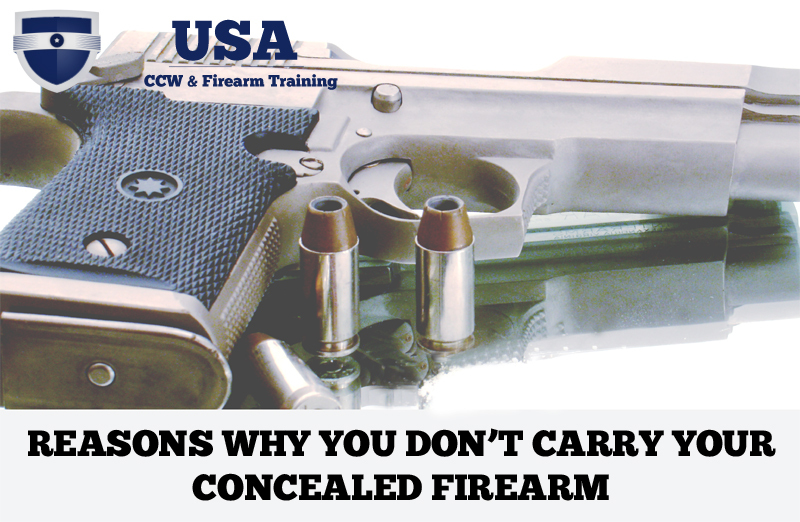 In Mid May of 2015 we started a series of articled designed to address the most common reasons why gun owners don't carry their legal concealed carry firearms every day. We gathered some input from our past students and our online followers and came up with eight core and common reasons people cite for not carrying a firearm. Most of us can relate to one or more of these. While they could be considered excuses they are real for the people who feel this way. Over the course of 3 weeks we dug deep and wrote a unique article to address each of these common reasons. If you relate to one or more of these and find yourself justifying leaving the gun in the safe each day please click below and read our best thoughts around the importance and technique of over coming these concerns! We hope you will Fall Back In Love With Everyday Concealed Carry! If you feel we are off mark or if one of your concerns isn't addressed here please leave a comment below! at all time if not, most of the time. I, like many my age must wear a support sock on my left foot, I then put a regular sock over that. All prior to dressing, the next thing is my back-up, North American 5 shot 22mag w/ laser,,,Then my trousers, once dressed, on my right hip in a leather belt slide, a Springfield 45cal Champion. if I leave home to go into town, I wear a vest to cover the side arm, and support the Smith & Wesson air weight 38+p.,,, don’t start that why so much armament? this is MY business…I live in a town 87% black…I am 73yo white 165 pounds. but I am also well trained with ALL three guns…and I plan on living a long time still. TRAIN, TRAIN.TRAIN. I agree with the above statement. your gun is like a carpenter without his hammer. your ccpermit. in this common day we live in; a gun is better than a hammer period. magazines to boot. too many unspecified people out there, use your brain first. I carry everywhere. My favorite saying “gun is like a parachute. If need one and don’t have one, you’ll probably never need one again”. At 68 yoa I intend live a great deal longer and be able to protect myself at all times. I don’t understand people that are CCW and only carry “sometimes”. They must have some inside information I’m not capable of knowing on when they will need it.